It is the birthplace of Juliette Gordon Low, founder of Girl Scouts of the USA, who was affectionately known by her family and friends as "Daisy." 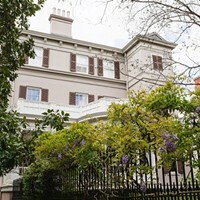 Built in 1821, the house has been elegantly restored to reflect the 1880s and furnished with many original Gordon family pieces, including artwork by Juliette Gordon Low. Located in the heart of the Savannah Historic District, "the Birthplace," as it is commonly called by Girl Scouts nationwide, was the city's first National Historic Landmark. Thu., April 18, 12 p.m. Mon., April 22, 3:30 p.m.
Wed., April 24, 8:45 a.m. Thu., April 25, 8:45 a.m. Sat., April 27, 8:45 a.m.